Selling Your Cabarrus County / Charlotte Metro Area Home? Why use Glen Tucker & Associates to represent you in the home selling process? Knowledgeable: Expert area knowledge. 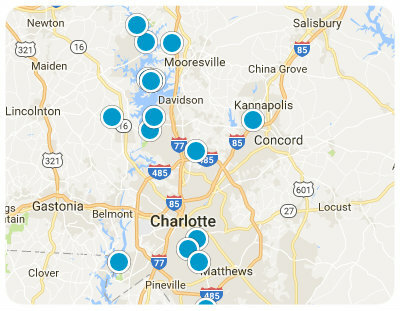 Local resident realtors in the Cabarrus County / Charlotte Metro area. We feel strongly that our job is to provide sellers with accurate and honest information regarding market conditions and the value of their home. Our intent is that sellers can use this information to assist in making important personal and financial decisions. It's our belief this should be done in a friendly, customer-based environment with zero pressure and frequent communication. Contrary to what many people believe, tax values and online estimating services are not always reliable. None of the online value estimate services have walked through your home or visited your neighborhood. Typically, we like to visit your home twice. During the first visit we explain agency relationships, talk about your goals and preferences and tour your home. We also wear our nice clothes, pet the dog, and try to get to know a little about you. During our second visit we: 1) Make suggestions for improvements to decrease market time and increase sale price; 2) Discuss our recommended list price; 3) Present our customized marketing plan for your home; 4) Listen to you. If for whatever reason it is not in your best interest to sell, we consider it an opportunity to have made a new friend and possibly a contact for future business. If and when the time is right for you to move forward with listing and selling your property, our team is ready to help.